I would love a possibility to add individual hashes to each slide, e.g. "/#design-project-xyz", "/#something-to-see", "/#another-project"… complementing the option of a fixed prefix. Best regards + have a brilliant day! I am looking for the same thing i.e. a way to customize the links of my different slides. Dmtry, is there a chance to implement such feature any time soon? I edited the royalslider deeplinking module that uses custom image names in the hash instead of indexes. I used a separate, hidden span associated with the image to specify the name. The caption wouldn't work for me, since I have longer caption text. I believe this falls back to using indexes if there isn't a custom rsImgHash element. I've attached the diff that makes changes to the 9.4.8 "dev" files used to implement this. The patch changes query.rs.deeplinking.js to set up the custom hash, and jquery.royalslider.js in order to read the custom image hash that the deeplinking module sets up. FYI, to apply the diff, use patch to apply the diff in the "dev" root directory. Looks promising Dave! Could you give more details on how to apply the diff file? Or even better could you provide a simple step-by-step? Once that's unzipped, you should have a "dev" directory. Now you need to run "patch" to apply the diff file's changes to the current directory of files. Great work @daveclay, thanks! My goal now is to use post slug in WordPress with a custom Mustache variable in a template of this awesome Royal Slider . Thanks Dave, it works like a charm. Cheers ! @Dave or @anynone: I do have an issue and I think it's related to the find() method you used in your custom deeplinking script. var imgHashElems = slide.content.find('.rsImgHash'); After clicking on a thumbnail, it makes the page jump right to the top of the slider making the header of the website hidden. How can I override that? I tried to replace find() by select() and I no longer have this page jump however with this method instead of having only the hash tag I've set up in the <span> it displays all the slide content ! Any help appreciated ! I've attached screenshots for you to better understand my issue. Thanks! I too would also like to see individual names implemented. has this gone any further? So would I just save then add jquery.rs.deeplinking.js to my site and reference it in the head? Your custom royalslider.js seems to be missing the part which adds .rsActiveSlide to the current slide - which I need for the functionality of my site also. Any ideas? Would be great if I can get both working. Just a comment to anyone who's having trouble implementing this.... Your custom hash tag cannot start with a digit. I was trying this with Youtube Video ID's and finally realized the one's that were not working began with numbers. Any plan to incorporate this into the core? http://www.nimbling.com/iso/ indeed, any plans on implementing this? Thank you for making an awesome slider. This feature that everyone is asking for would come in super-handy though. Having old links that reference the wrong slide every time I change the slide order is not ideal. I haven't been able to get these code examples that others have provided to work on my site. Hi whit, I read all the thread and I was able to use custom names looking the source code of the site posted by gdu. I attach the deeplinking JS file modified. I really appreciate you helping me out with this. I'm having the same problem with your code that I had with gdu's code. When I use this new code, the names of the slides display up in the URL as I move from slide to slide, but my video slides will no longer play the videos. Also, if I paste the address of one of my slides into a browser, it always goes to the first slide instead of the slide listed in the URL. I understand if you can't look into this further, but I thought I'd go ahead and post it just in case someone knows what might be happening. 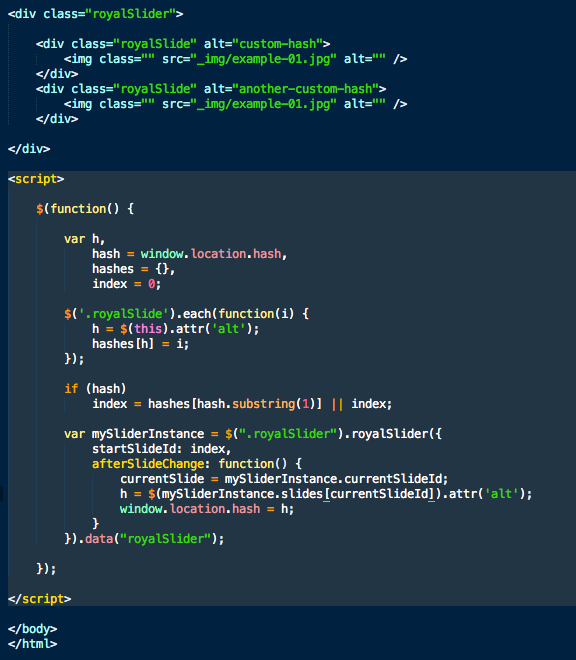 @whit, try getting unimified version of slider JS file from build tool, and include it. As currently you have a mixed code blocks, which are minified in different methods. I tried utilizing the "fixed" deeplinking.js file provided by Elena and it failed miserably (with deeplinking options on and hidden spans in place). This is a bit frustrating given hash changes on slides are a fairly common feature and with a mandatory suffix in place it pretty much destroys the entire use for it. * - Added timeout before hash changes to 750ms to avoid reloading animation. '$:nomunge'; // Used by YUI compressor. // Method / object references. // though the event isn't supported, so also test document.documentMode. // leading #. Thanks for making this necessary, Firefox! // Called only when the first 'hashchange' event is bound to window. // If window.onhashchange is supported natively, there's nothing to do..
// will create a polling loop and possibly even a hidden Iframe. // Called only when the last 'hashchange' event is unbound from window. // Otherwise, we need to stop ours (if possible). // Iframe to enable back and forward. // Remember the initial hash so it doesn't get triggered immediately. // Start the polling loop. // Stop the polling loop. // when running in "IE7 compatibility" mode. // Iframe for history handling. // by using techniques from http://www.paciellogroup.com/blog/?p=604. // Load Iframe src if specified, otherwise nothing. // initial page scrolling (yes, this works). // (yes, very useful) wrap this with a try/catch block. // is still necessary for back/next to work at all! // Get history by looking at the hidden Iframe's location.hash. // been set, update that as well. // Update Iframe with any initial `document.title` that might be set. // actually adds a history entry. // Set document.domain for the Iframe document as well, if necessary. // Update the Iframe's hash, for great justice. This allowed us to not have to use .rsImg (gave weird results for our setup) and instead use .rsImage inside of our #slideshow (typically, this is .rsSlider by default). It needs to be optimized but for now, it works and returns the full .rsImage's alt attribute. it works perfectly in the url but when I tried to put the url in another browser, I always go on the first slide. I had to replace #slideshow by my correct id. So I maybe it could help other people, be carefull in the deeplinking js file, you have to repalce #slideshow by the id you use. For some reason I can't seem to get the linking to a specific slide to work i.e. Should then go to that specific slide in the slider, correct? For some reason it doesn't. It changes the url but then doesn't go to that slide. I'm using the deeplinking script as per the above comment by @mothership, above, and that's working perfectly i.e. adding the correct end to the url and I can also directly link to a slide by entering the full url in a new browser window. Any help or ideas would be much appreciated as I can't figure out why this wouldn't be working. The link above is removed, however I have another question. I would like to pull the perm-hash out of a data attribute. What would me the easiest way to do this ? I am using RS in this case as an image-slider only.